On the Cover: Why one side of Iapetus is dark and the other side is bright has been a mystery since Giovanni Domenico Cassini discovered this Saturnian moon more than 300 years ago. Cassini's namesake spacecraft is now exploring the Saturn system on a primary mission that will include nearly 80 orbits of Saturn. Cassini swings by Titan on more than half these orbits and has frequent reasonably close encounter with most of the other moons. Iapetus orbits Saturn at three times Titan's distance, so Cassini had only one chance—on September 10, 2007—to swing out on a specially planned, highly elliptical distant orbit and view the yin-yang moon up close. This global portrait of the bright side of Iapetus shows the complexity of the boundary between the bright and dark material. Close inspection of the image reveals that there is no "gray" on Iapetus; moving from the dark to the bright regions, the dark stain on Iapetus' leading hemisphere breaks up into smaller and smaller patches, concentrated on crater floors and equator-facing crater walls. 4 Worlds Beyond: Andre Bormanis looks at the next generation of spaceships. 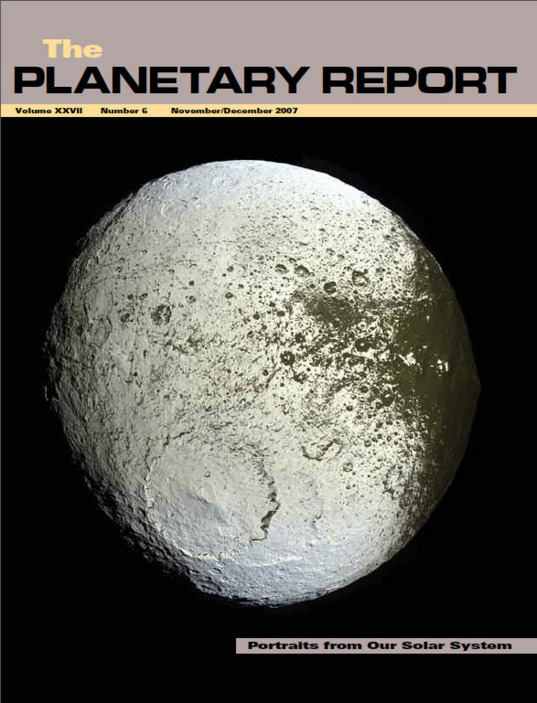 10 A Night to Remember: The Planetary Society's 2007 Awards Ceremony: Andrea Carroll recounts the evening. 12 2007—The Year in Pictures: Emily Stewart Lakdawalla showcases 2007 in spectacular space images. 19 Q&A Mars-crossing asteroids: What are the chances of impact?